Phil Kaufman, famed music producer and manager, drove out of Los Angeles International Airport on Sept. 20, 1973, in a 1953 Cadillac hearse and merged onto the freeway toward Joshua Tree, California. Michael Martin, the owner of the hearse, sat beside him. Having just stolen the body of country rock pioneer Gram Parsons, the two men were about to forever emblazon their names on the pages of rock 'n’ roll lore. 43 years later and 150 miles to the south, I clicked a brand new 2017 Yamaha SCR950 into gear and headed out across the Anza-Borrego Desert. It was early on a Friday afternoon in late August and temperatures were already hovering around 100 degrees. 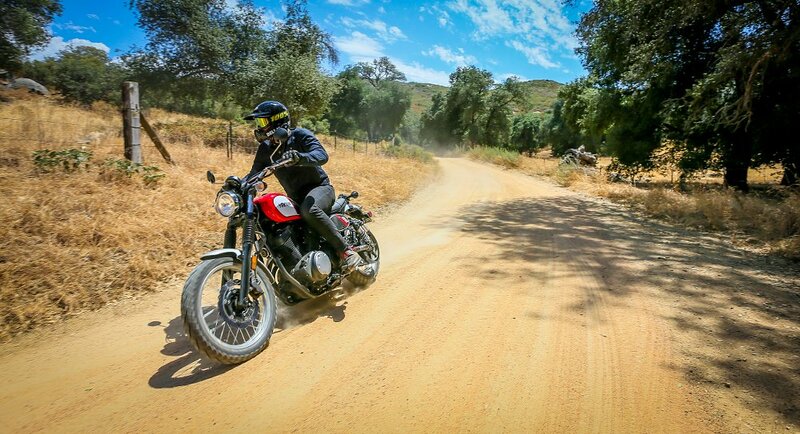 Having wrapped on the review for the SCR950, I had a new motorcycle at my disposal and 48 hours to kill in Southern California. I aimed the bike toward Joshua Tree and pinned the throttle, chasing Gram Parsons’ ghost and the music he inspired. For outdoor buffs, Joshua Tree National Park is a picturesque location to camp, explore, and climb. For musicians in the 1960s and 1970s, it was a refuge from the fast-paced city life of Los Angeles. This desert region is often credited for influencing what would come to be known as country rock in the 1970s. Gram Parsons was at the forefront of the new genre, which blended traditional country, blues, and rock. The beauty of Joshua Tree is especially visible at dusk. Photo by Spurgeon Dunbar. Parsons' first real musical break came when Roger McGuinn invited him to join The Byrds, replacing David Crosby, who left the psychedelic rock group in 1967. While Gram only hung around for about a year, it was long enough to lend his influence to 1968’s “Sweethearts of the Rodeo,” which was, for all intents and purposes, the first “alt-country” record. From there, Gram moved on to form The Flying Burrito Brothers Band before going solo with a then-unknown singer named Emmylou Harris. Playing this game of mental music trivia with myself helped to pass the time as I worked my way north along the western coast of the Salton Sea. Yamaha's SCR950 was proving to be a simple but adequate machine for this trip. 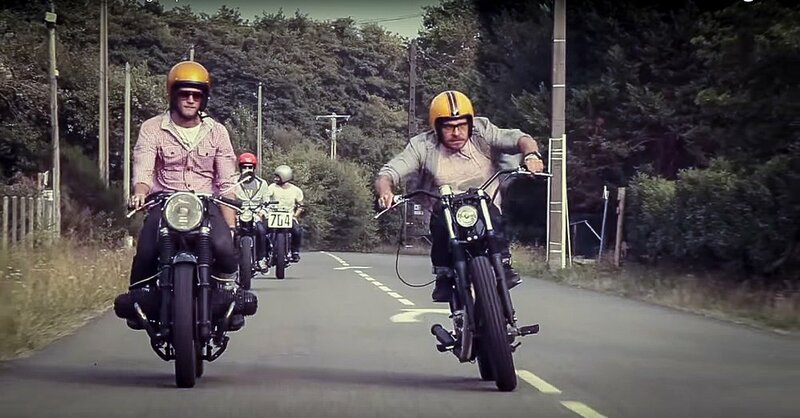 Its air-cooled V-twin easily thumped along at 75 mph, paying no mind to the oppressive heat. I leaned back, using the duffel bag strapped across the passenger seat as my personal sissy bar. I’ve ridden bikes across the Southern California desert before and I am always left with a sense of peace that comes from the vast expanses of sand, dirt, and sky. While its beauty is never quite strong enough to lure me into becoming a permanent resident, I find myself drawn back from time to time to visit. I could see how Parsons would have found serenity in these quiet hills. The memorial to Gram Parsons sits out front of room number eight. Photo by Spurgeon Dunbar. During the late 1960s and early 1970s, Gram would take countless trips to Joshua Tree. Unlike most struggling musicians at the time, who were trying to escape the pressures of borderline poverty, while striving for success in an unstable line of work, Gram had the opposite problem. As the heir to a vast Florida orange grove fortune, he was plagued with demons from his past and a family wracked with conflict. Running from his problems, Parsons would escape to the desert, where he would regularly stay at the Joshua Tree Inn. It was there Parsons passed away from a drug overdose in 1973. He was just 26 years old. The Joshua Tree Inn is still operational and proved to be a hell of an experience in its own right. Photo by Spurgeon Dunbar. The old inn is still standing and I decided it would make a perfect place to bed down on this particular trip. From the front, it looks like any other run-down, roadside motel you would find in a small desert town. The simple cinderblock design and Spanish-style roof was offset by a bright, freshly painted, blue door. Planting the SCR’s kickstand in the broken gravel next to a Triumph Bonneville, I dismounted and headed inside. Hidden tables, waterfalls, and landscaping offered patrons multiple nooks and crannies to which to escape. Photo by Spurgeon Dunbar. My friend, Karen, owner of the 2013 Triumph Bonneville parked out front, had agreed to join me for the weekend and was already waiting at the hotel. She rode out from Los Angeles and was relaxing in the courtyard by the time I showed up. Karen atop her Triumph Bonneville after a long ride from Los Angeles to meet me in the middle of the desert. Photo by Spurgeon Dunbar. Karen had moved to L.A. from Texas in a beat-up Dodge Ram with a dirt bike in tow. Eventually, both were sold in order to buy a more fuel-friendly scooter. The scooter was later traded for a less-than-reliable 1976 Honda CB360 before she settled on the Bonneville. As she was more interested in riding than wrenching, the Bonneville, with its classic looks and modern reliability, was a logical alternative to the persnickety Honda. In addition to being an avid motorcyclist, Karen consumes vast amounts of music. She can debate the virtues of 1980s metal and modern alt-country in the same conversation. As she’s the kind of friend who doesn’t think twice about riding across the desert for an impromptu motorcycle trip to chase old ghosts, she proved to be the perfect companion for this trip. We spent the night drinking cheap (but cold) beer at the Joshua Tree Saloon. After which we took turns dazzling the audience with our karaoke skills. I think it was right about the time I lost a bet and had to sing Nickleback’s “This is How You Remind Me” that the crowd began to turn. My rendition of Hal Ketchum’s “Small Time Saturday Night” couldn’t save us and we decided it was a good time to retreat to our hotel. Back at the hotel, we dug through Spotify, dissecting albums touched, either directly or in spirit, by Gram Parsons. I opted for direct influences like The Eagles' sophomore effort “Desperado,” Elton John’s country-rock masterpiece “Tumbleweed Connection,” and The Rolling Stones’ “Exile on Main Street.” Karen favored modern examples like The White Buffalo’s “Once Upon a Time in the West,” Whiskeytown’s debut album “Faithless Street” and a live album by Son Volt, the name of which I can’t recall. Despite the vast disparity of origins, all of these records felt rooted in the desert where we sat. Luggage options for this trip were intentionally simple. We were able to fit everything we needed into duffle bags, which were lashed down over the back seat. Photo by Spurgeon Dunbar. The next morning, we lashed our luggage to our pillions and rode through town, stopping for breakfast at the Crossroads Café. From where we stood, we could see the turn off for Quail Spring Road, which leads deep into Joshua Tree National Park. Following this route, you will eventually come to Keys View Road. Stop at the intersection and you’ll see Cap Rock, a large rock formation, looming on the horizon. It’s here where Paul Kaufman parked the hearse and unloaded Gram Parsons’ stolen corpse, 43 years earlier. As the story goes, it was Gram’s wish to be cremated in Joshua Tree. Supposedly, Kaufman had made a pact promising to carry out the request should his friend meet an untimely demise. Kaufman later explained to the police that this was his reasoning for stealing Parsons’ remains. Once the body was unloaded, Kaufman doused the coffin in gasoline and set it ablaze. While authorities arrived on the scene in time to extinguish the flames, and return the charred remains to Parsons’ family in Louisiana, Gram’s legend was forever amplified. Splitting the difference between fact and fiction became nearly impossible as rumors of the event spiraled out of control. Leaving Joshua Tree later that morning, I thought about Karen’s rationale for swapping to the Bonneville. Her experience mirrored my decision to purchase a Triumph back in school. As a broke college kid, I wanted a vintage bike but needed reliable transportation to escape at the end of a long day in the classroom. With the SCR950, Yamaha provides new riders with another vintage-inspired alternative. Will it attract a new generation of riders looking to abscond from the complex world of Biology 101? Karen and I took our time leaving Joshua Tree, exploring the surrounding desert. Photo by Spurgeon Dunbar. 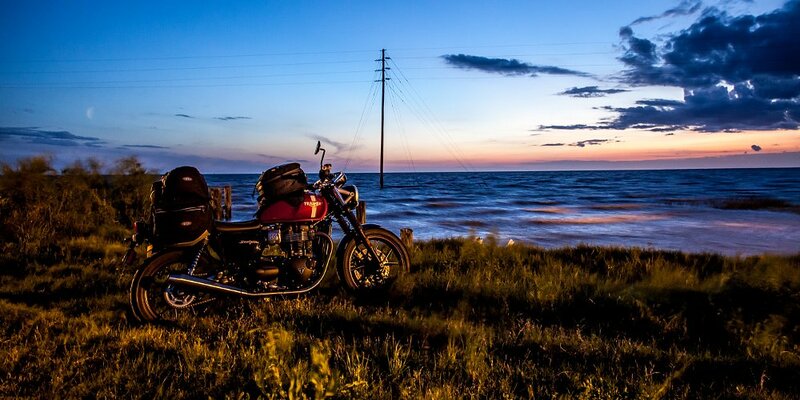 Motorcycles still provide the simplest method for escape. Unlike Gram Parsons, I wasn’t running from family obligations, just searching for adventure at the end of a long week. I love when I am able to blend multiple interests into one trip. I tore into Los Angeles with the dust of the desert still caked on my skin. Having left Gram’s ghost for others to chase, I decided to swing by Barney’s Beanery in West Hollywood to see if Steve McQueen was still drinking in the corner.